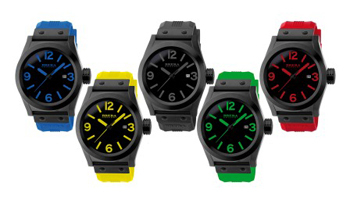 Olympic Watch Watches By Brera.The countdown to the London Olympics has already begun. The countdown to the London Olympics has already begun. And how to keep the best if not with a clock? For the occasion, Watches Brera has made even more timely and summer Eternal Solotempo proposing his model with strap and matching indices in different colors of the Olympic rings. In this way you can wear a watch at every race different but always inspired the Olympic spirit and its universal symbol. Suitable for both him and her, Lord Solotempo is a luxury watch that retains the aesthetic seduction of Italian style, classic yet casual. The diameter, or brushed stainless steel with black IP treatment, is 45 mm, and can be worn on the wrists smaller, while maintaining the style simple and elegant. Dial with three-dimensional, date at 3 o’clock, quartz movement MIYOTA 23.15. Eternal Solotempo also has the possibility of rapid replacement of the strap, therefore, the Olympics ended, the green light to mix & match: changing the rubber strap every time you get a colorful clock summer.